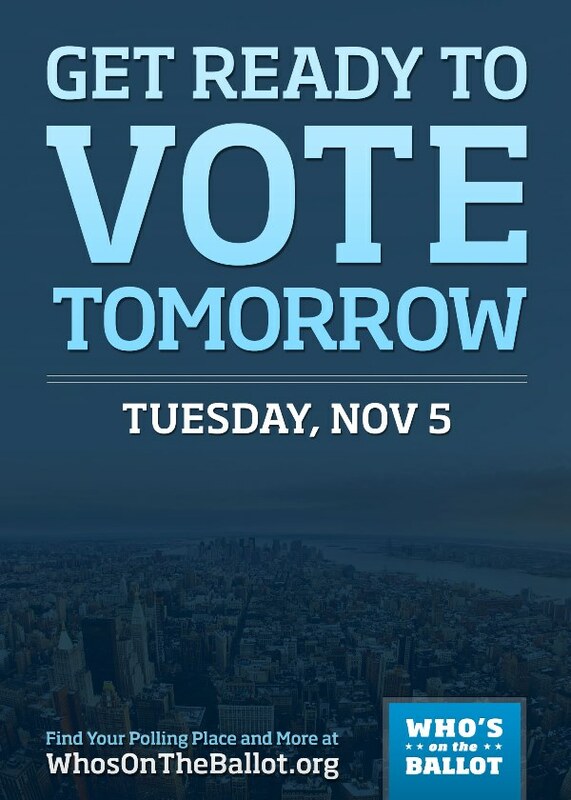 Cast your vote tomorrow to elect the next Mayor, Comptroller, Public Advocate, Council Members, Borough Presidents, District Attorneys, and many more. Poll sites are open from 6:00 a.m. to 9:00 p.m. Find your polling place, information on candidates and ballot proposals, and much more on our main page. Also, registered voters who cannot make it to their polling site on Election Day can apply in person for an absentee ballot. Deliver your absentee ballot application to the BOE office in your borough (no later than the day before the election) and receive your absentee ballot immediately. Make your voice count, see you tomorrow at the polls!